The final comics sales reports are out from Diamond Comic Distributors, and as reported here on Friday, Comichron's estimates based on those reports show that DC's "Villains Month" propelled the market to top several previous records from the Diamond Exclusive Era. Click to see the sales estimates for comics ordered in September 2013. 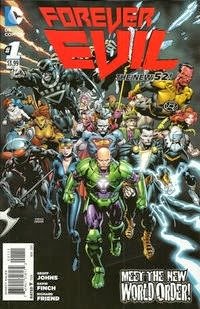 DC released 53 different issues featuring villains, each (apart from the chart-topping Forever Evil #1) numbered as part of a parent title: for example, Batman #23.1 featured the Joker, #23.2 featured the Riddler, #23.3 featured the Penguin and #23.4 starred Bane. While each title was intended to have a 3-D cover, demand resulted in the printing of a second "standard edition" version. The result was that DC had 129 new comics releases in September, of which 128 made the Top 300; that figure is only one less than its record high from early in the DC relaunch. That latter figure blows away the previous record by more than a thousand copies, and results largely from the added number of DC entries this month. There's more volume higher up on the chart, and many of the titles usually in the lower rankings were pushed off the Top 300 completely. Perhaps in response, Diamond expanded its list for this month to go down to the end of the Top 400 — and as usual, there are random issues beneath that which appeared in the Small Publisher Top 50. All of the Top Comics calculations below continue to be for the Top 300, so as to compare like against like. The average comic book in the Top 300 cost $3.60; again, the average comic book retailers ordered cost $3.69. The median and most common price for comics offered was $3.99. Click to see comics prices across time. For the curious, the additonal 100 copies on the list adds about 430,000 copies, or about 4% more comics to the usual Top 300 list; it adds $1.6 million, or 5%, in dollars. That's expected, as books lower on the list tend to have higher prices. From the glimpses we get of the lower echelons of the list, it would appear to fall off dramatically from there, with #400-500 adding another 100,000 copies worth $400,000 or so — and by the time we reach #500-600, we're well out of the frontlist and only about 40,000 copies worth $160,000 are being added. So it looks like the total comics sale is in the 9 million copy range, worth close to $33 million; the Top 300 captures 90% of the periodical activity. That leaves $15 million for graphic novels and trade paperbacks, of which more than half is captured in the Top 300 graphic novel list. And the overall Direct Market dollar breakdown is about 2/3 comics, 1/3 graphic novels — which is about what we've seen in the recent past. That's September. See everyone at New York Comicon!